Studio Warner Bros Pictures has released the first teaser of Oceans 8 on Monday (18/12). Teaser presents a brief overview of the action of the thieves who became the main character of the film. Teaser Ocean's 8 starts with meeting Sandra Bullock and Cate Blanchett at a cafe. Cate Blanchett asked, "Why do you need to do this?". The question for Sandra Bullock is likely to refer to the motive of theft. Sandra Bullock plans to steal a diamond from the Met Gala event. Sandra Bullock enlisted the help of Cate Blanchett and several other women. Teaser Ocean's 8 then shows footage of the women's action. Must See: Shock Jonghyun Died, Witnesses Reveal Minho SHINee Fainting at the Hospital? There Rihanna who plays with cutlery, Mindy Kaling check the condition of the diamond until Anne Hathaway who tried to seduce a man. The trailer then ended with the action of Sandra Bullock crouching before the tomb of Danny Ocean. Danny Ocean is a character played by George Clooney in Ocean's trilogy in the early 2000s. Danny Ocean often perform a number of theft actions. 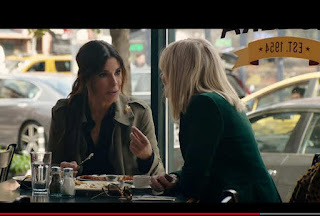 In Ocean's 8, Sandra Bullock plays the role of Danny Ocean's sister Debbie. The story of Ocean's 8 more clearly will be revealed on the trailer released on Tuesday (19/12) local time. While the film directed by Gary Ross is only aired on June 8, 2018. 0 Response to "Action of Thieves Diamonds in Teaser Prime Oceans 8"